Below is a list of the most common types of guinea pigs found as pets. This is not an all-inclusive list and other breeds may be available. Many cavies can have regular or satin hair. Satins have finer hair with a natural sheen that glistens. The Abyssinian has tall round swirls of hair all over its body and come in a variety of colors as well as satin. 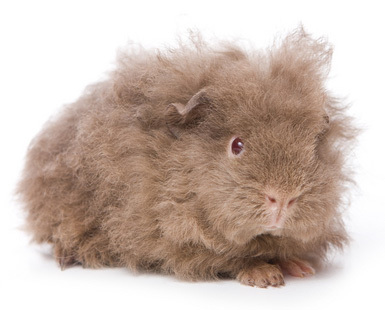 The American is a smooth, short-haired cavy with a rounded body and comes in a variety of colors as well as satin. This is the most common and calmest of all the guinea pigs. These guinea pigs are smooth and short-haired but also have a swirl of hair on the forehead. A cavy with a white swirl and the rest of the hair a different color is known as a White Crested. These pigs are a combination of Cresteds and Silkies. They have long hair as well as the swirl of hair on the forehead. The Peruvian has the longest hair of all cavies. They have hair that falls over the eyes and long hair parts down the middle of the back. They come in a variety of colors as well as satin and require a lot of grooming. The Silkie has short facial hair and very long hair that does not part down the back. They come in a variety of colors as well as satin. These are almost hairless guinea pigs. Other than a few short hairs they are mostly naked. The Teddy has fuzzy or frizzy hair that stands up, like a teddy bear. It comes in a variety of colors as well as satin. The Texels have a long curly coat and require a lot of grooming.